Home Writer's Note: This is an unedited version of my October 2003 column. Roughly the first half of the column was edited out when it appeared in the magazine because the publisher felt that no matter how he edited it, it would sound like "sour grapes." I concede that I was not in the best mood when I wrote it, but I believe that the information presented is accurate and something that needs to be said. If you want to dismiss it as "sour grapes" then that is your prerogative, but don't tell me that I didn't try to warn you. It has been an interesting and frustrating month. Shortly after I wrote my last column I held my production sale. To say that it was a disappointment would be a major understatement. We had a total of 18 registered buyers for 109 animals, and only eight actually bought anything. We wound up hauling over 70% of the animals back home because nobody even bid on them. What do you expect when the animals outnumber the buyers almost 14:1. At first I questioned whether the quality of the animals caused the poor sale. As I think back on it though, I recall that most of the people who came and looked Saturday afternoon returned on Sunday for the sale. If the animals were the problem, I doubt most of them would have bothered coming back for the sale. The problem was almost nobody even bothered to come look at what we had. Then I started hearing reports from the other sales that breeders were selling unsound goats and/or goats with cull defects for ridiculous prices. 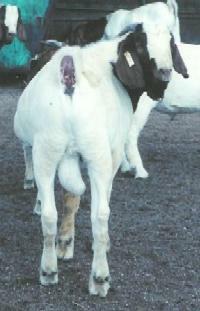 A goat with only one good teat for $1,700.00 here, a buck with no pigmentation for $3,100.00 there, does with fishtail teats for over $1,000.00 each another place, etc. Obviously quality mattered not at all. I even saw some of the animals that people paid megabucks for at these other sales. Quite frankly I was astonished by the prices paid for goats that I would have been hesitant to sell for less than $100.00 to a producer for use in a commercial herd. After looking at the animals I asked the buyers why they would pay that kind of money for such mediocre stock (I'm paraphrasing here because I don't think Terry would print the actual terminology I used). Undaunted, every one of them had the same answer. They pulled out the registration papers or sale catalog and started showing me the goat's pedigree, and expounding upon how great this bloodline or that has done in the show ring, and how it is full South African, blah, blah, blah. It seemed not to matter in the least to them that the particular goat they had just bought for a ridiculous price had about the same chance as a popsicle in Hades of placing anywhere but last at a show, and that's assuming that the judge even let it in the ring to begin with. As I thought back to my own sale and the few people that came to look, but didn't come to the sale, I recall that they were the ones that were upset because I didn't have the animal's pedigrees available and/or didn't know which goats were full South African. Not that the pedigrees would have helped them, since most of my goats show nothing but US registration #'s on their pedigrees, and the animals on them were sought after several years ago but are largely forgotten now. Silly me, I was selling goats, but it's apparent that your average buyer is buying paper, not goats! After six or seven generations you would think that it wouldn't matter whether the goat's ancient relatives traveled here via Canada, Australia New Zealand, etc. 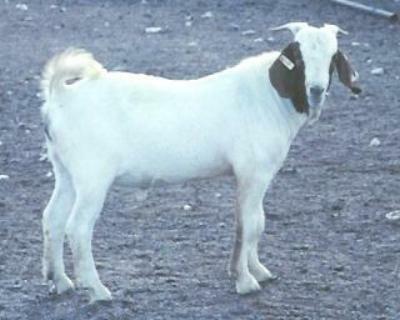 Just because a goat is out of a certain sire or dam or was produced by a certain breeder does not make it valuable. Breeding two National Champions to one another does not necessarily produce outstanding offspring, and buying from a big name breeder is no guarantee of quality. I sometimes wonder if these folks even look at the goats before (or after) they buy them, since some have obvious cull defects, while others are no better than what they could have purchased for a fraction of the cost somewhere else. Unfortunately, some of the big name breeders have no qualms whatsoever about letting you pay a small fortune for an animal that should be culled. To be fair, in some cases the breeders announced before the bidding began that the next lot has a cull defect, and the buyers practically trampled one another to buy the defective goat anyway. 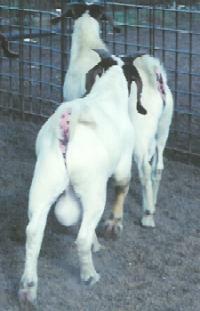 In other cases the breeder took a "buyer beware" approach and let culls sell unannounced. 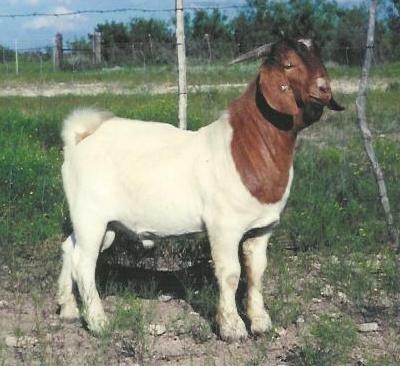 Conversely, two no name goats can produce outstanding offspring, especially, when you are dealing with a breeder, like myself, whose stock haven't won a show primarily because none of them have ever been entered in a show. At least we went to the trouble of sorting our goats, and sending the culls to the sale barn (where the tickets were marked unsound so no unsuspecting buyer would buy them for breeding stock). It is apparent that most of the people getting in the Boer goat business don't have any idea how to select goats. This leads them to use shortcuts like buying their stock only from breeders who are winning shows. Then they limit their purchases to "full South African" animals that are out of this year's show winners. Of course, since all the other newcomers are doing the same thing they all wind up paying ridiculous prices for the limited number of goats out there that match those criteria. The question that keeps nagging at me though, is who do these people think they are going to sell their production to? If the only people newcomers will buy stock from is the big name show goat breeders, and the list of big name show goat breeders is virtually the same now as it was five years ago, then all these people who just paid north of $1,000.00 per head for their animals can count on selling their production at the sale barn for weighing price, approximately $1.00/lb live weight on a good day if you hadn't checked lately. If anybody cares to know, you will never get the $1,000.00 plus you paid for your does back after adding in feed and other expenses selling your production for weighing price through the sale barn, just ask all the other people who have traveled that path before you. For around $100.00 per head I would be happy to set you up with a commercial herd that would actually make you money selling your kids for weighing price. I know other breeders in my area who have bought high dollar stock with impressive pedigrees at these production sales. They all had high hopes of being the next big name show goat operation, and selling their animals for ridiculous prices too. It didn't happen, and now they are selling animals they bought for premium prices at the sale barn and getting out of the business because they cannot give them away to other breeders let alone sell them for a fair price. The fact is they had just as good a chance, maybe better, of being successful in the show ring buying their stock from myself or another breeder like myself for a small fraction of what they paid the big name breeders. If you look at the results of the major shows what do you see? Most of the top placing animals were raised by the breeder that showed them, and almost all are owned by one of the big name breeders. The winning breeders don't buy their animals at a show goat breeder's production sale. Obviously, most show goat breeders aren't selling you their best animals at their production sale. If they did, how would they win next show season? If they don't win next show season then nobody will be coming to their production sale next Labor Day, and if nobody comes to their sale, then they will be selling their animals through the sale barn for weighing price. Contrast that with a breeder like myself. I have no show string, and don't show. However, I do have genetics that have been successful in the show ring as evidenced by the number of ennobled animals on their pedigrees. If I'm reducing my herd, like I did this year, I have no need to keep the best kids for myself. In fact, when I put together this year's production sale I included every fullblood kid I had that didn't have a cull defect. I have no need to keep kids when I am already overstocked with more productive mature does. Out of 109 animals what do you suppose the odds were that there were at least a few that would be successful in the show ring? I venture to say you have a better shot at buying a winner from someone like me then from somebody who has to keep their best animals for their own show string. Barring some kind of error on the part of the breeder I can virtually guarantee you that the show breeders did not put any animals that they even remotely suspected would win at nationals or any of the major shows in their production sale. I remember an incident that occurred several years ago when another local breeder purchased a buck from one of the big name show goat breeders at a production sale. A couple of years after purchasing the buck they showed him at San Antonio where he won his class. The breeders were on him like white on rice trying to buy that buck back saying that he wasn't supposed to be in the production sale, and they had intended to keep him for their own breeding program. Every once in a long while the big name breeders screw up and sell an animal that they meant to keep, but generally you'll get to see their best animals next year at nationals and other shows at the end of the breeders' leads as they are being placed ahead of your goats, and you'll get to buy those goats' offspring next Labor Day. Not that doing so will help you. The show goat business is driven by fads, and the hot genetics this year will be passé next year when you are ready to sell them. If Super Buck's kids were hot this year and sold for thousands, you can rest assured that when you go to sell the grandkids of Super Buck next year nobody will want them because everybody that wanted Super Buck genetics already has them, and now everybody wants Super Super Buck genetics. Of course, the only place to get those genetics is from the big name breeders who didn't sell Super Super Buck at their production sale. No, while you were paying top dollar for also rans, Super Super Buck was being collected for the breeders' embryo program, and preparing to stomp your goats in the show ring so you would pay top dollar for his kids next Labor Day. Most buyers would be better off learning how to select good goats, and buying them from the numerous breeders who have excellent goats and don't show, then bidding up every animal at a show breeder's production sale even if that animal is defective. The market for quality Boer goats would be healthier too. Expanding the sources that buyers were willing to purchase from would increase the supply and reduce the average price buyers paid. From the seller's perspective, there would be winners and losers. The breeders who currently can't give even their best animals away except for slaughter would finally be able to sell them for a good price. The big name show breeders would see reduced demand and lower prices for the stock sold at their sales, and might even have to sell their culls for slaughter. Finally, the biggest beneficiary would be the breed itself. Currently, goats are bought based on breeder name recognition and pedigrees, neither of which are guarantees of quality or soundness. If buyers start purchasing only those animals that are superior without regard to who the breeder is or what the pedigree says, than the breed will benefit from having superior animals used to perpetuate the breed while inferior animals are sent to slaughter and removed from the gene pool. Adding to my frustration, after the sale debacle I tried to help an acquaintance out by selling a group of 297 black, Spanish does. These were really nice, uniform, large framed animals (see photo below) that had already kidded at least once. Most were 3-4 years old. Generally I don't get too excited about Spanish goats because most are inbred, nasty little things that are more trouble than they are worth. This group though obviously was an exception. In the past I have seen large quantities of comparable, unregistered, commercial Boer cross does sell in Texas for up to $125.00 per head. These were just as good. Best of all they were already bred, and would begin kidding in a few weeks. Most of the time I am skeptical of such claims, but when I went and looked these does were "bagged up" already. The clincher was the price, they were willing to sell them for $10.00-$25.00 per head less than I can find comparable quality, open, Boer cross does for. I thought man this should be a no-brainer for someone wanting to start a commercial herd. Buy the does and bucks for $26,730.00, get a kid crop out of them immediately that will be ready for market when prices spike in the spring, put the bucks in with them again a couple of weeks after they finish kidding, and get another kid crop out of them 6 months later. Doing a little quick math I figured about 450 kids weighing 60 lbs in the spring at $1.25/lb (that's where I project prices for 60 lb kids to peak in the spring) would gross $33,750.00 from the first kid crop. That is more than it cost to buy the herd. The second kid crop would sell 3-6 months later, but since the Muslim holidays are pretty early again next fall I expect prices for 60 lb kids to be around $1.00/lb at that time. That means the buyer would gross $27,000.00 off the sale of the second kid crop. That is a total of $60,750.00 in less than a year from a herd that cost $26,730.00 to purchase assuming that you had the pasture to raise the herd on and didn't have to provide supplemental feed to them. If I had the land, I would have bought these goats so fast it would have made a bolt of lightning look like cold maple syrup pouring from a container by comparison. Apparently, I know nothing though. Everybody I offered these does to had the same reply. Not interested. 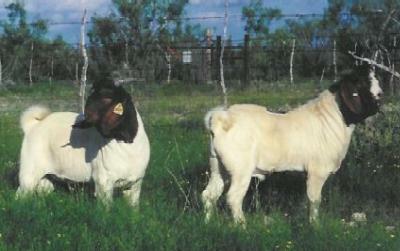 We want open, Boer cross does with red heads. Don't even want to see the pictures. This is getting ridiculous. The same size herd of comparable size/age, open, Boer crosses will cost them $32,670.00, and will produce one kid crop in the next year that will sell for $27,000.00. This is supposed to be a business decision folks, not a fashion show. 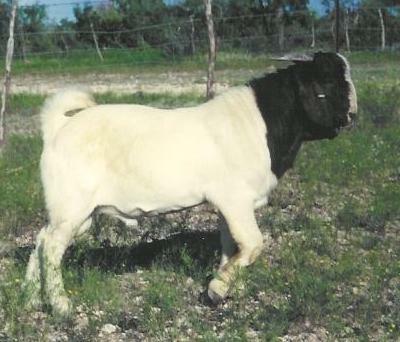 If you breed black Spanish does to fullblood Boer bucks (not $100.00 sale barn specials that you think are fullbloods because they look really good and have red heads, but are really Boer crosses) you will get mostly red head and black head kids. You can't tell the 50% kids from the Spanish does apart from the 75% or higher kids that the Boer cross does produce. What are you selling, the does or the kids? Normally, the answer is the kids, so if that is your product why are you worrying about whether the does are red heads or solid blacks? It doesn't matter. A good doe is a good doe, and the color of the doe has nothing to do with it. A doe that is going to produce kids worth twice what it cost to purchase her in the next year is a much better buy than a doe that will take two years to do the same thing. As if all that wasn't frustrating enough, I turned to my usual outlet for my production, commercial producers, to get my bucks sold. I usually have pretty good success selling my bucks in that market since we raise our animals on pasture, cull the junk out rather than selling it, and performance test. As luck would have it one of my friends was putting together an 1800 head shipment to go to Michigan. Normally that would require 54-72 bucks. However, in this case the buyer only wanted 30 bucks and didn't want to pay more than $200.00 per head for them. Even with good bucks a ratio of one buck to 60 does is a little much to expect out of the bucks. I can only hope the buyer planned on staggering his breeding dates. One of the area show goat breeders (a breeder who has had pretty good success in the show ring and whose name you would probably recognize) had 20 or so bucks that he thought were ideal for my friend's shipment. The price was definitely right, and my friend was so happy to get that part of the order filled that the goats weren't inspected that closely before purchase. I don't recall the exact price, it was in the $100.00 to $150.00 per head range, but I knew as soon as I heard it what the bucks looked like. Out of curiosity I went over and looked at them anyway. What I found was a bunch of cull goats that should have been sent directly to slaughter a year ago when they were weaned. Now they were about 18 months old weighing a whopping 100 lbs each. There are few things that make me angrier than show goat breeders who sell their culls as commercial herd sires. Trust me, if a show goat breeder who normally sells his stock for high prices is offering you bucks for a fraction of what they normally sell for, you can rest assured that there is a reason. The reason is probably that the bucks have serious defects, and are culls that should have been sent to slaughter. I was skeptical that these bucks would even survive being shipped, and if they died en route that would probably be the best thing that could happen for this poor sap who insisted on buying cheap bucks. I certainly hope the buyer doesn't plan on retaining any of the offspring for replacements. Several of the bucks had only one testicle (see photo). Others had bad bites like the parrot mouth in the photo. Then there were the ones that had poor pigmentation. Finally, some had weak pasterns causing them to develop "turkish slippers" even in the rocky terrain they came from (see photo). I can hardly wait to hear how thrilled the new owner is with having to constantly trim his buck's hooves. 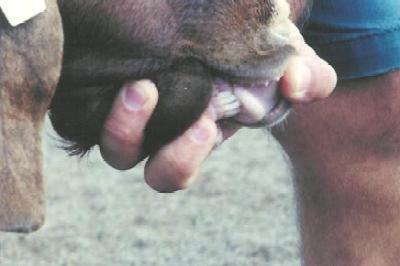 Goats with weak pasterns don't wear down their hooves as effectively as goats with good pasterns, and become a hoof trimming nightmare. If he retains the kids he can look forward to trimming their hooves too. That should be a lot of fun in an 1800 head herd. I wonder how much money he will spend on extra labor to trim hooves the next few years? Want to bet that it is more than the amount that some good bucks would have cost him? If there was a single buck in the group that didn't have a cull defect I didn't see it. Then there is the not so small matter of the buck's general appearance. I'm sorry, but a yearling buck that barely weighs 100 lbs is pathetic. We had kids that weaned off pasture at 3 months with no supplement that were almost as large as these bucks. I don't know what conditions these bucks were kept under, but why would you want to take a chance that their kids would be similarly slow growing? Contrast the cull bucks with my bucks that just came off test (see photos below). They are a year younger yet outweigh the older bucks already. Yeah, they would cost you three or four times as much, but there are no culls in the group. 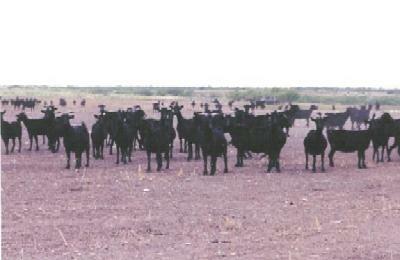 Its obvious that they possess the genetic potential to improve a herd instead of setting a breeding program back. That kind of quality doesn't come cheap. To start with the testing fee is $100.00 per head. Then we have to cull some of them, and send them through the sale barn where they only bring about $75.00. The additional cost we have in the culls has to be recovered through the sales of the good ones. Of course, we also have the costs to maintain their sires and dams. By the time you add it all up the production cost for each buck is two to three times what some of these people want to pay for a buck. What few seem to grasp is you can pay a few hundred dollars more for your bucks up front, and get that money back many times over from the added revenue their kids generate, or you can buy cheap unproven cull bucks and pay for them every time you sell a kid and work your goats. Ultimately the cheap bucks are far more expensive then the quality bucks. After I looked at the bucks I called my friend to suggest that the buyer was probably not going to be very happy when he got this shipment of bucks, and maybe the bucks should be returned to the seller and some other bucks found for the order. "Oh no, my buyer is going to be ecstatic when he gets those bucks for that price" was the reply. Never mind that better conditioned cull bucks could have been bought at any sale barn for half the cost. I don't know who is crazier, my friend or the buyer. I guess I'll find out when the shipment gets there. In the meantime, you'll have to excuse me now while I go beat my head against the wall. Maybe some of this will make sense then.